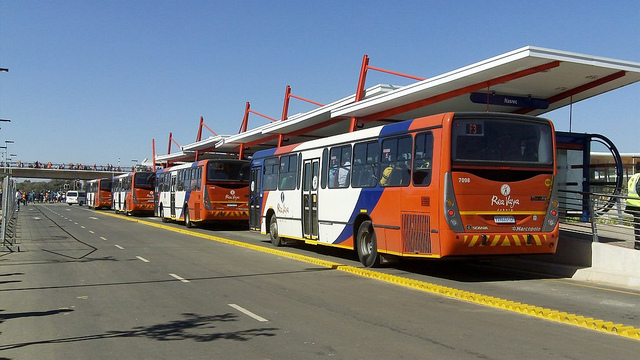 Johannesburg, South Africa, home of the Rea Vaya bus rapid transit system, earned top marks in the Economist Intelligence Unit's African Cities Index. Photo by AfricanGoals2010. The Economist Intelligence Unit (EIU) recently released the African Green City Index, examining the environmental sustainability of select African cities. The 15-city study is the EIU’s first time including African cities in its Green Cities Index series, which has previously included cities across Europe, Asia, Latin America, the United States and Canada. The African Green City Index assesses both quantitative and qualitative elements of cities’ environmental performance, as well as current and future environmental policies. Environmental categories included in the assessment are energy and carbon dioxide, transport, water, waste, land use and environmental governance. Delia Meth-Cohn of EIU cited that the African Green City Index might function as a benchmarking tool to help aid understanding surrounding sustainability. The cities that finished with scores in the “above average” range were Accra, Cape Town, Casablanca, Durban, Johannesburg and Tunis. A team of MIT researchers are developing algorithms that estimate driver behavior at intersections, including whether or not they will run red lights. The algorithms are based on two popular machine learning approaches, Vector Machines (SVM) and Hidden Markov Models (HMM), and were validated using real traffic data collected from more than 10,000 intersection interactions. The U.S. National Highway Traffic Safety Association (NHTSA) estimates that in the U.S. 45 percent of injury crashes and 22 percent of roadway fatalities are intersection-related. Jonathan How of the MIT research team proposes that the algorithms might find future application in “smart cars,” helping drivers anticipate and avoid potential accidents. The most dangerous time of the year for pedestrians is late November, according to a pedestrian crash study by Global News. Using data collected from 2000 to 2009, the study found that eight out of the top 10 worst days for pedestrian crashes fall between November 21 and November 30. Global News suggests that the trend is attributable to seasonal darkness coinciding with rush hour work travel. A similar study conducted by the City of Toronto found that pedestrian crashes are comparatively higher from October through January—the months of increasing darkness and with the shortest days. Spacing Toronto magazine offers timely public education campaigns as a potential solution to this problem. A study by Portland State University students sheds light on the elusive, long-considered question of who is better at obeying the rules of the road: cyclists or car drivers? The students monitored intersections around campus to find that cyclists ran more red lights. The study observed 497 cars to find that only 7 percent of drivers ran red lights, as compared to 58 percent of the 99 observed cyclists. Cyclists were monitored at three intersections, two of which contained cycle tracks. Cyclists were also more likely to run red lights on streets with cycle tracks, with about 70 percent of cyclists running red lights on these types of roads, as compared to less than 40 percent of cyclists on roads without the added infrastructure.